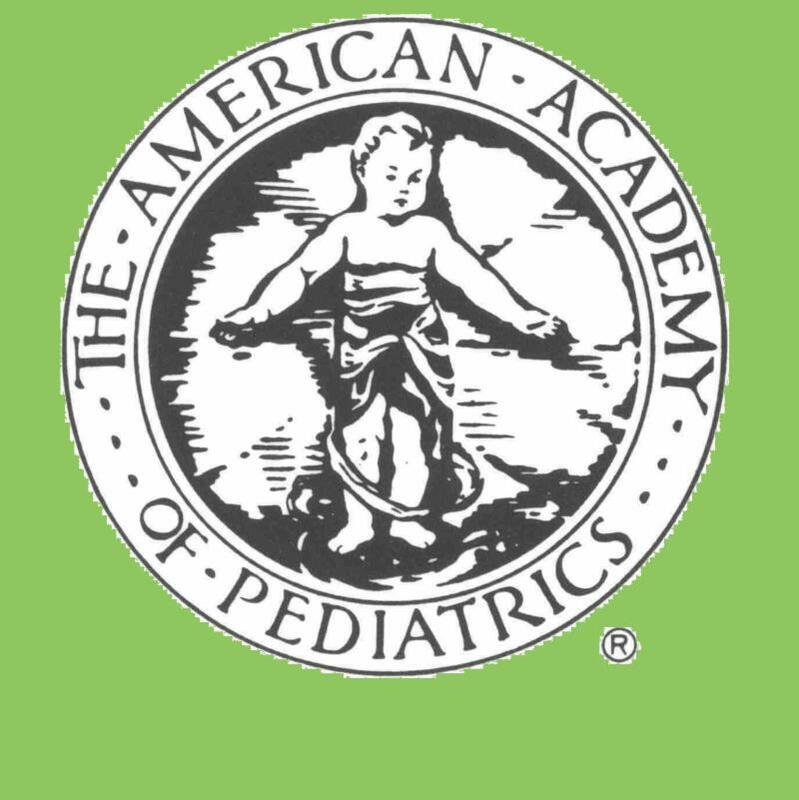 A new study in Pediatrics presents transition planning findings among youth with special health care needs, and, for the fi rst time, youth without special health care needs, from the 2016 National Survey of Children’s Health. The study, Transition Planning Among US Youth With and Without Special Health Care Needs , reveals that nationally, only 17% of youth with special health care needs and 14% of youth without special health care needs met the overall federal Maternal and Child Health Bureau transition performance measure. T his underscores the need for health care providers to work with adolescents and parents/caregivers to prepare for transition by having time alone during preventive care visits, actively working with adolescents to gain self-care skills and to understand changes in health care at age 18, and discussing the eventual shift to providers who cares for adults. Seeking to address long-standing gaps in payment for transition to adult care, The National Alliance to Advance Adolescent Health convened an expert panel of payers, plans, professional organizations, and advocacy groups and conducted 65 key informant interviews to identify and prioritize alternative payment models and quality measures. 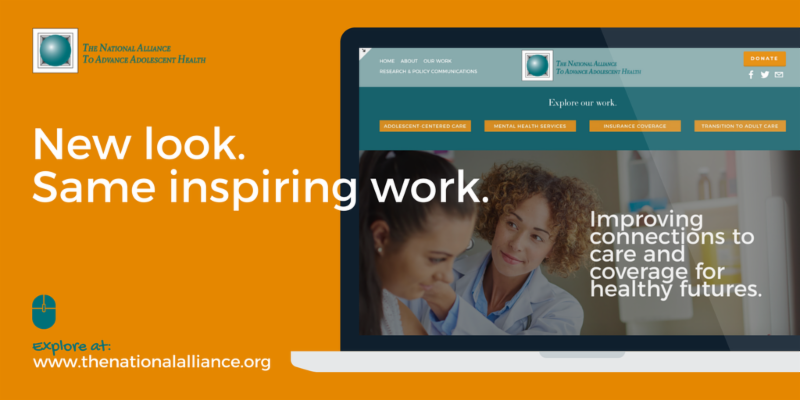 Funded by the Lucile Packard Foundation for Children’s Health, recommendations for implementing value-based payment (VBP) pilots are published in a new report, Recommendations for Value-Based Transition Payment for Pediatric and Adult Health Care Systems . The leading VBP recommendations selected by the leadership roundtable participants were enhanced fee-for-service, infrastructure investments, and pay-for-performance. For each VBP option, the report describes a variety of ways to structure financial incentives in both pediatric and adult care delivery settings. To incorporate quality of care measures, roundtable participants also prioritized triple aim quality measures that can be aligned with VBP options. Finally, the report concludes with a set of dissemination strategies. State Title V agencies in 37 states and jurisdictions have prioritized transition as part of their 2018 Maternal and Child Health Services Block Grant Program. 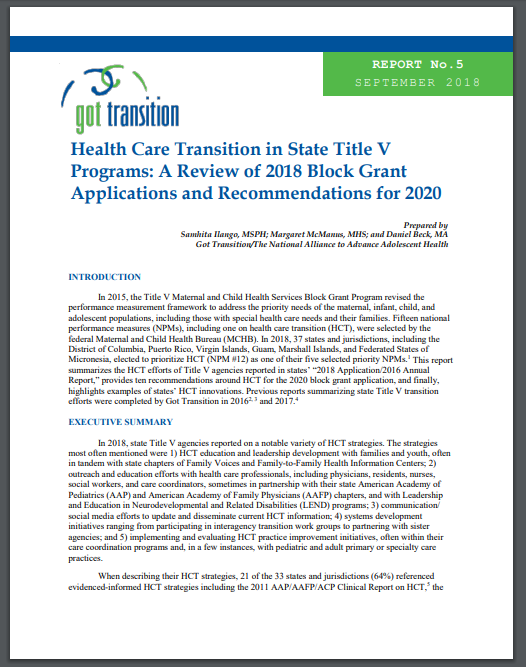 Got Transition’s new report, Health Care Transition in State Title V Programs: A Review of 2018 Block Grant Applications and Recommendations for 2020 , highlights examples of health care transition innovations in 32 states, the District of Columbia, and Puerto Rico pertaining to 1) education and leadership development with families and youth; 2) outreach and education efforts with health care professionals; 3) communication and social media efforts to update and disseminate state-of-the-art HCT information; 4) systems development efforts with sister state agencies; and 5) practice improvement initiatives. The report also offers a detailed set of recommendations for the 2020 State Title V Action Plan, due in 2019, which will lay the groundwork for the following five years. Got Transition is seeking feedback from health care clinicians (physicians, nurses, social workers, etc. ), researchers, government agencies, youth/young adults, family members, and others to update the Six Core Elements of Health Care Transition. To offer your comments on the Six Core Elements and accompanying tools, please click on this SurveyMonkey link . The 19th Annual Chronic Illness and Disability Conference: Transition from Pediatric to Adult-based Care will be held on Thursday, October 25, 2018 and Friday, October 26, 2018 in Houston, TX . 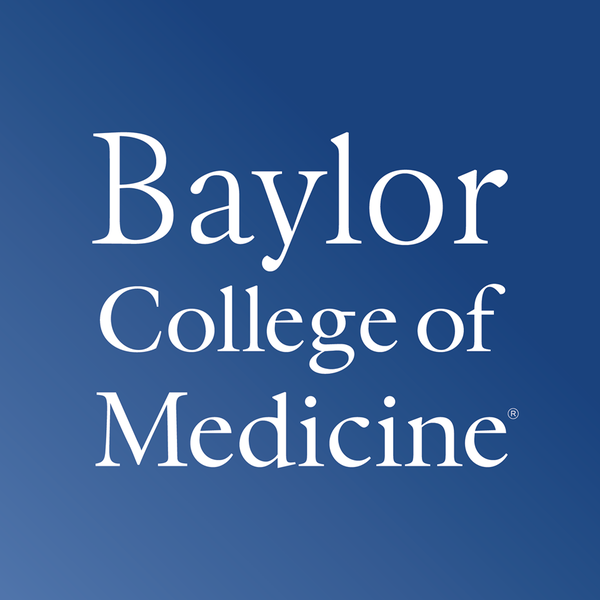 The activity is approved for AMA PRA Category 1 Credits™ which will be co-provided by Baylor College of Medicine and Texas Children’s Hospital Association. In conjunction with the annual conference, the International and Interdisciplinary Health Care Transition Research Consortium (HCTRC) will hold its 10th Annual HCTRC Research Symposium on October 24, 2018 in Houston, TX . Register now! ¿Está listo para la transición a la atención médica para adultos? Got Transition has translated its Young Adult Transition Quiz, “Are you ready to transition to adult care?” into Spanish! 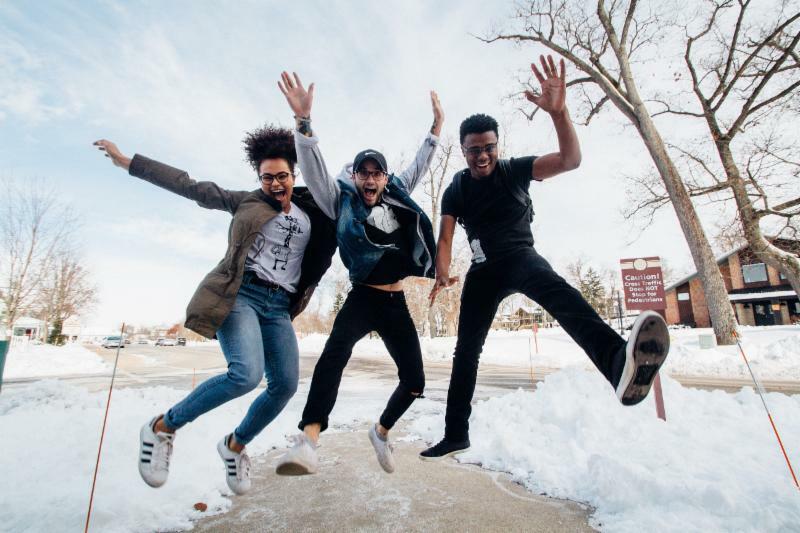 Like the English version, the online quiz asks key questions to help young adults prepare for changes that happen usually between 18 and 22. It includes tips and linked resources to support young adults to be self-advocates (such as how to add medical information to a smartphone, what legal changes occur at age 18, how to sign up for health insurance, and more). Got Transition is a program of The National Alliance to Advance Adolescent Health , supported by the Health Resources and Services Administration (HRSA) of the U.S. Department of Health and Human Services (HHS) (U1TMC31756). The contents are those of the author(s) and do not necessarily represent the official views of, nor an endorsement, by HRSA, HHS, or the U.S. Government.